How to spend 1 day in Paris? Coming to France and you only have 1 day in Paris to visit? Here is a list of must see places to help you make the most of the few hours you have. You won’t be able to spend 1 day in Paris without seeing it since it can be seen from everywhere in Paris! If you don’t have much time, don’t bother climbing in the tower as the line can be very long, unless you bought skip the line tickets in advance. But you can take very nice pictures of it from the Trocadéro or the Champ de Mars. Consider 90 minutes for the visit, and around one or two hours of line depending on the season. More information here. Another must see monument. When visiting the Arc de Triomphe, you will have a view of the Champs-Élysées right beside you. If you want to have a spectacular view over Paris from the top of it, do it during the day if the weather is nice, or on the contrary do it at night to have an awesome view of the lights on the city. Consider one hour to 90 minutes (line+visit). More information here. 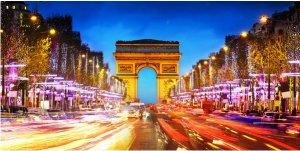 It is located at the foot of the Arc the Triomphe, you can combine the two visits. This great and most beautiful avenue represents the luxury and the prestige of Paris thanks to its numerous luxury shops. If you love to take a stroll do not hesitate to walk along the avenue and enjoy its vibe. Duration up to you! More information here. One of the oldest monuments of Paris. You can enter for free the cathedral to visit it and admire its beautiful glass windows. Consider a line of approximatively 30 minutes and around 30 minutes to enjoy your visit. More information here. Biggest museum in the world, the Louvre Museum hosts more than 300 000 pieces, from the Antiquity to the 18th century, including master pieces like the Mona Lisa or the Venus of Milo. 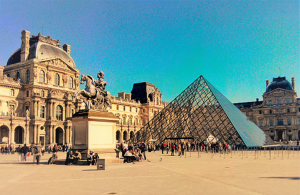 If you only have 1 day in Paris, you could spend your whole day in the museum! The Glass Pyramid at the entrance is nowadays the symbol of the museum and the square in front of it offers a great perspective for pictures. If you want to visit it, you should consider at least 2 hours for the visit and the same for lining up (unless you’ve got skip the line tickets). More information here. 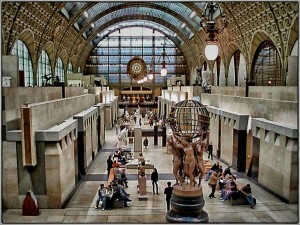 A nice alternative can be the Musée d’Orsay, second most visited museum in Paris after the Louvre. Specialized on the impressionism period, you will see there paintings, sculptures, photographes, graphic arts and architecture from the 19th and 20th centuries. Consider 2 hours to visit entirely and around 1 hour for the line. More information here. So many things to see in 1 day in Paris in such a short time. 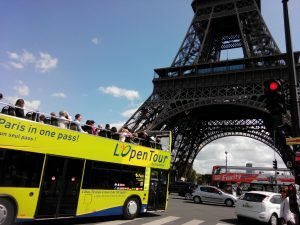 A solution to have a global overview of all the must see places in no time is to get a city tour in bus which will take you to all the famous monuments listed above and much more (the Concorde Square, Invalids, Montmartre, Sacred Heart Basilica…). 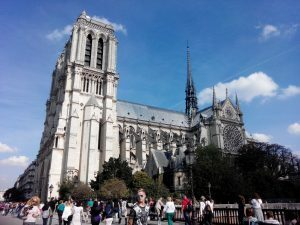 You can also choose a river cruise: the most emblematic monuments of Paris being located on the banks of the river, you will see them under a mesmerizing angle in only one hour. Don’t forget when planning your 1 day in Paris to consider transportation time to one place to the other. If you want to avoid losing your time in the transport you might want to book a private driver to drive you around for the day.